A gazebo is a beautiful accent to any back yard project. At Randy Jaacks Rustic Woodmen Decks, we offer a wide collection of gazebos to fit our customer’s style and landscape needs. A comfortable, Western Red Cedar gazebo allows you to enjoy your backyard for three full seasons. Our gazebos are manufactured with the highest quality and workmanship in the industry and we offer our customers the best in design and expertise. At Randy Jaacks Rustic Woodmen Decks, we only use the best materials available to ensure each and every one of our products is made to meet our high-quality standards. Whether wood, vinyl or a custom design, we are confident our handcrafted gazebos will be a great addition to any outdoor space. 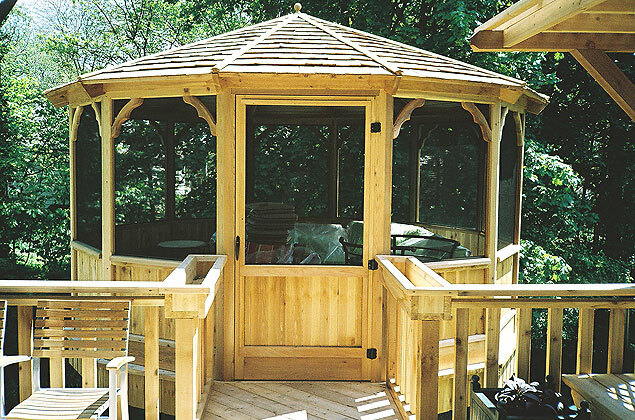 Our cedar gazebos are offered in many appealing designs and many different styles. We offer gazebo screens, plexi-glass windows, solid or spoked bottoms, detailed wood corners, and varying roof pitches are all available. Gazebos are also a great way to add privacy to your spa or hot tub. Our gazebos are manufactured in a shop with precision equipment that gives you consistent quality. Our gazebos can be installed on your new or existing deck, patio, or backyard. They are also available in kit form and can be delivered to your home for easy self-installation.